Probably the best known climbing paradise is Kalymnos, a small island in Greece. We could not miss this island on our cycling and climbing trip through Europe. 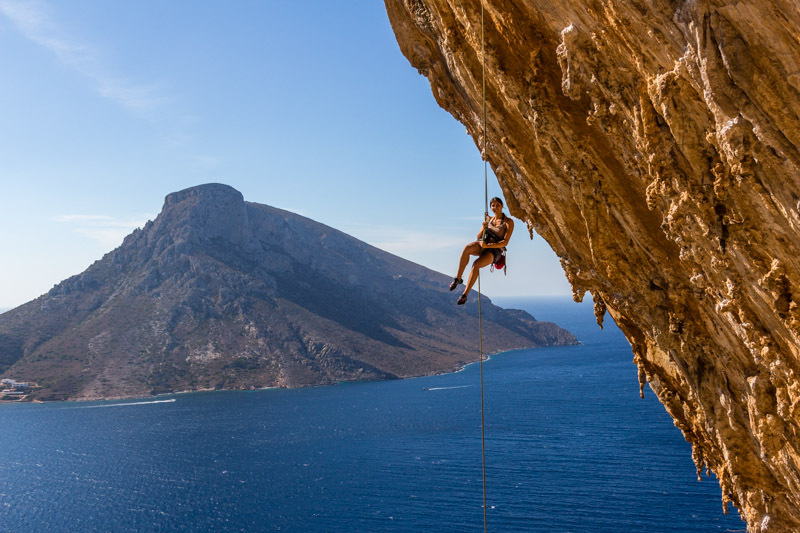 And we can agree: climbing in Kalymnos is world class: Thousands of routes in all difficulties, beautiful surroundings, nice beaches and good weather… what else do you need? We missed a nice climbing community! We were there in high season in October and there were tons of people. This means, we also had to stay in line sometimes for climbing routes. After the climbing day, people disappear either in restaurant, their hotels or bars… so it is hard to form friendships with other climbers. But how accessible is the island by bicycle? You will find out! More about our climbing adventure on Kalymnos can be found in our blog-post. Hanging around in the Grande Grotta. Climbing on Kalymnos is just fantastic. Rock and routes: The rock and the routes are simply some of the best on this planet. 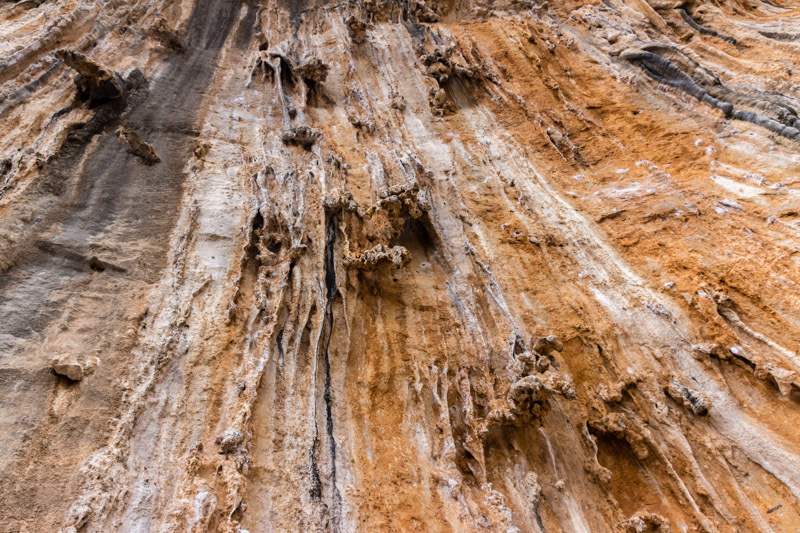 On Kalymnos you find more or less everything: lots of steep tufa routes, but also vertical limestone. There is even some strange white rock next to the beach, which feels again completely different. Climbing sectors such as Odyssey, Grande Grotta, Ghost kitchen and many more provide climbing routes for a lifetime of climbing. Climbing area and environment: The view from the wall is most of the time just spectacular. Crystal clear blue water below you and the island Telendos on the other side. The base of the all is usually quiet comfortable, but be aware of goats, that like to steal food! The approach to some of the climbing areas can be long and you have to hike uphill for a bit. Guide book and information: We had the 2016 edition of ‘Kalymnos Rock Climbing Guidebook’ by Aris Theodoropoulos. This book shows are climbing areas with clear photo topos and makes it easy to find the different climbing areas. Everything is possible here, from French grade 4 up to 9, but the majority might be between 6t and 7th French grade. Summer might be too hot, as lots of walls are south facing. Winter can be wet and windy, so perfect seasons are spring and autumn. Climbing features at Ghost Kitchen. 3D tufas everywhere! Accommodation: There is no campsite on Kalymnos, so your only option is a guest house, or a hotel. Most climbers stay in small rooms, which might provide a small kitchen area. The prices are rather high (30€ for room), especially in high season. Access to food: Small supermarkets are everywhere on the island, so food is easily accessible, but also rather pricey. Access to water: The tap water on Kalymnos is not for drinking, but there are several water stations along the road to fill up bottles. Access by bike: Getting to Kalymnos with the bicycle is no problem, as the ferry from Athens takes bikes. Unfortunately the ferry arrives early in the morning and we had to cycle in the dark to the other side of the where the climbing areas are. Getting to the climbing areas by bicycle can be tough, as the island is very hilly. The main climbing areas around ‘Grande Grotta’ are easily accessible by bike. However, other areas such as ‘Ghost kitchen’ are a bit harder to reach. Unfortunately we could not get to areas like ‘Sikati Cave’ or ‘Secret garden’, as there is a rather high hill in the way. 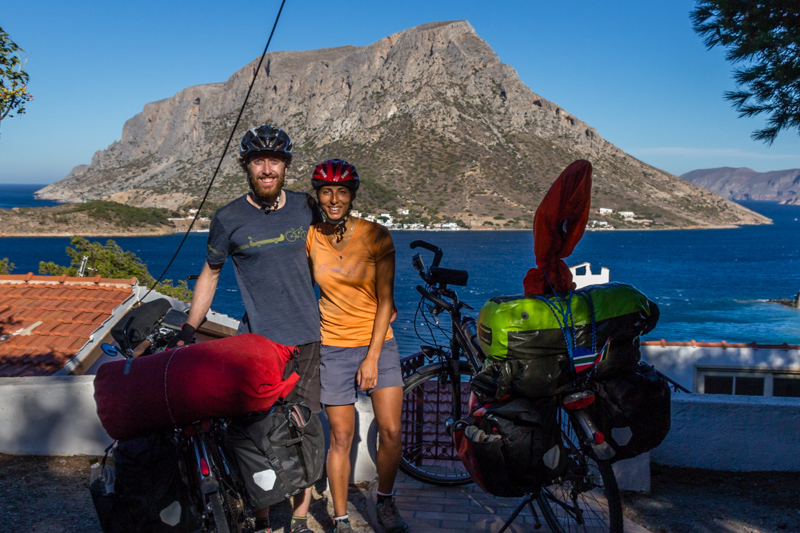 Cycling and rock climbing at the same time is possible, and we even made it to Kalymnos in Greece.